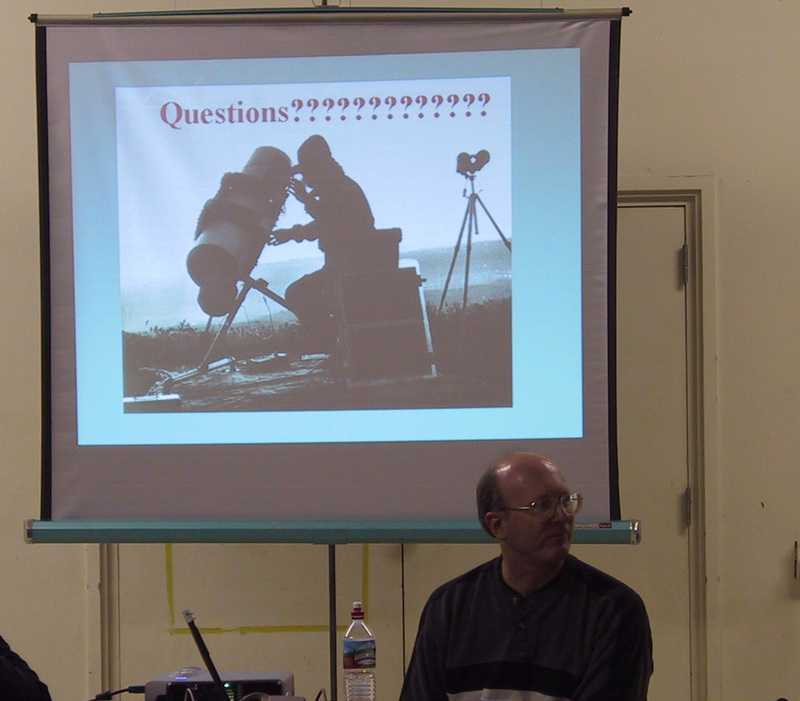 Don Machholz gave the talk at the November meeting of the SJAA. He covered all of his cometary discoveries and related them to the music he was listening to at the time. Saturn dominates the night sky in February, rising well before sunset, so it's high in the sky all evening. It shows a ring tilt of about twenty-three degrees to us, still quite generous. As I write this, the Huygens probe is still descending toward Titan, and we don't yet know what lies on Titan's surface. But you should know by the time you read this! Perhaps it will add to your observing sessions, watching Saturn's brightest moon and thinking about what the probe found. Jupiter joins Saturn later in the evening, rising a few hours before midnight. It won't get as high as it did last year: this month, its maximum transit altitude is only 46 degrees. "Maximum transit altitude" -- what's that? That means that when it's due south, as high as it's going to get before it begins its descent toward the western horizon, it will be only 46 degrees above the horizon. That's high enough to be mostly out of the mucky layers near the ground, but not quite high enough to give the sharp high-magnification views that planetary observers love so much. It is high enough, though, that you should have no trouble seeing some of the details of Jupiter's stormy atmosphere ... that is, if they aren't blocked from view by our own stormy atmosphere! Mercury, Venus, Uranus, Neptune, and Pluto are all lost in the sun's glare most of this month, though ambitious observers might want to try spotting Mercury in evening twilight during the last few days of February. Mars, too, is near the sun, but its small five-arcsecond disk can be spotted during morning twilight. On February 8th, it passes a little over half a degree north of the Lagoon nebula, which should make a nice wide field sight for early morning observers. And don't forget Comet C/2004 Q2, Machholz! It's past closest approach, but it should still be easily visible, even from fairly light-polluted skies, if it keeps performing as well as it has so far. It's a lovely comet in photos, with two well-defined tails, and the coma is bright enough to be easily visible in binoculars even from light polluted locations. From a dark sky, if you can get a clear night, it should be a killer!